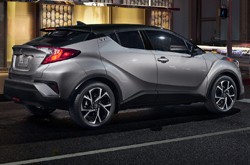 Last year's C-HR, was the first generation of the Toyota subcompact SUV. For 2019, it has been minimally tweaked. Toyota aligned the cost of the C-HR more closely to other subcompact SUVs. 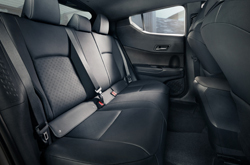 With technology changing rapidly, it makes sense that Toyota enhanced the tech features on this crossover. Changes to the 2019 C-HR include an upgraded Entune 3.0 infotainment system. 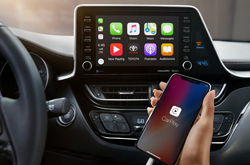 For 2019, the C-HR audio system integrates with Apple CarPlay. The 2019 C-HR trims differ slightly, due to changes to the entry-level offering. The LE is the entry level trim for 2019. Meanwhile, the mid-range XLE trim comes standard with new features like a smart key, vanity mirrors with lights, an 18-inch wheel upgrade, and automatically folding mirrors. Lastly, the upper Limited trim offers drivers premium features. The Limited stands out from other C-HR trims, thanks to piano-black B pillars, chrome-accented windows, a red bumper garnish, and interior comforts like brown or black leather seats, driver-seat lumbar support, and rain-sensing wipers. 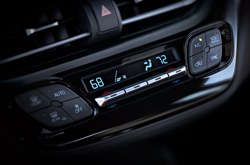 Toyota also upgraded the connectivity system in the Limited to Entune 3.0 Premium. Last year's inline 2.0 Liter 4-cylinder DOHC 16-Valve with Valvematic, comes back from last year and it delivers 144 horsepower. Sure, the engine is made for on road driving, but when paired with the CVTi-S transmission, drivers can enjoy a Continuously Variable Transmission with intelligence and Sport, Normal, and ECO shift modes. Load your C-HR with people and cargo, because it can carry 3,300 pounds. Fuel efficiency is also a plus, given that the C-HR gets an EPA estimated combined 29 miles per gallon. How is Toyota Improving Safety? While the 2019 Toyota C-HR has not yet been tested for crash and rollover ratings, drivers can see for themselves how Toyota takes safety seriously. For increased driver awareness, Toyota offers several technologies offerings to increase safety in the C-HR. One available option is the vehicle's backup camera with rear-facing 8" display screen. Rear Cross Traffic Alert with Blind Spot Monitor is also available on the 2019 C-HR. Not only has awareness improved but so has visibility. Drivers all have access to vehicle information in real time with the vehicle's available 4.2" multi-information display. Confident driving comes when you know your C-HR will alert you to necessary vehicle safety information. Visit North Park Toyota in San Antonio today to test drive the available 2019 Toyota C-HR trims!